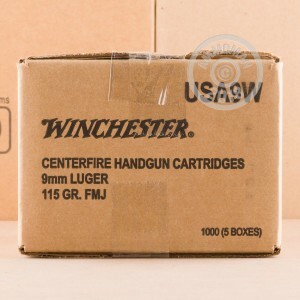 Whether you're training for a self-defense situation or simply looking to have a good time at the range, this 200 round pack of 9mm Luger cartridges can help you save! 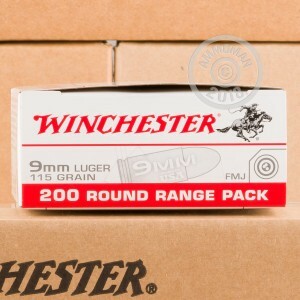 Manufactured by Winchester in the USA, these rounds use a standard pressure charge and produce mild recoil. Each cartridge fires a 115 grain full metal jacket bullet at a muzzle velocity of 1,190 feet per second. 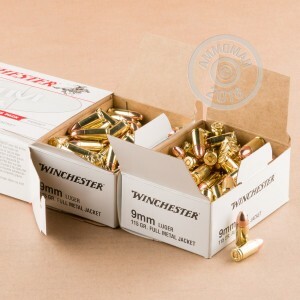 These cartridges use non-corrosive Boxer primers and brass cases as well as clean-burning propellants that will cut down slightly on the amount of fouling accumulating in your firearms. Grab a few of these packs or any items totaling $99 or more at AmmoMan.com to get free shipping!